This canvas comes in a gold frame with linen liner and brass nameplate. "A banner hangs in Castle Hemingham in England that reads, 'Nothing is truer than truth.' No matter what your status, upbringing, or influence, you can't create Truth. 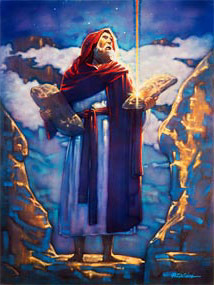 God gave His Truth to Moses — written in stone. His Truth is not relative to any factors in life; it is simply Truth, as powerful today as it was when those two tablets were freshly carved by the finger of God all those centuries ago." The Truth copyright© by Ron DiCianni.